This $6M, 40,000SF mixed-use project at the southeast corner of Michigan and Broadway is being led by Partner Steve Carmina in partnership with developer Roger Trettel, with RP Oak Hill as construction manager. The buildings at 163-167 Broadway and 64 Nash (circa 1820's and 1880's), will be redeveloped into 18 new apartments and 9,052 SF of commercial space, complete with indoor parking, a restaurant, and 2,000SF donated to a local nonprofit cultural organization, the NAACP. Located in the heart of the Michigan Street African American Heritage Corridor, this is a very important corner; the potential for this building and the surrounding area is quite substantial, with Steve stating "it will be a beacon for people visiting the city to learn about African-American culture, the Underground Railroad, and why the street and city are important." CELEBRATE: Surprise Sprinkle for JESSICA MUEHLBAUER and her soon-to-be bundle of joy! Thanks to Hearth+Press for a delicious lunch! GRAND OPENING: WELCOME SPOT COFFEE TO KENMORE! SOCIAL MEDIA: YOU LIKE US, YOU REALLY LIKE US! We joined CB Emmanuel Realty to celebrate the groundbreaking of the transformation of the former Buffalo Public School 63 into the Lofts at University Heights! We brought the Buffalo Silo's to life at a local Tops Friendly Markets at the annual CANstruction event! 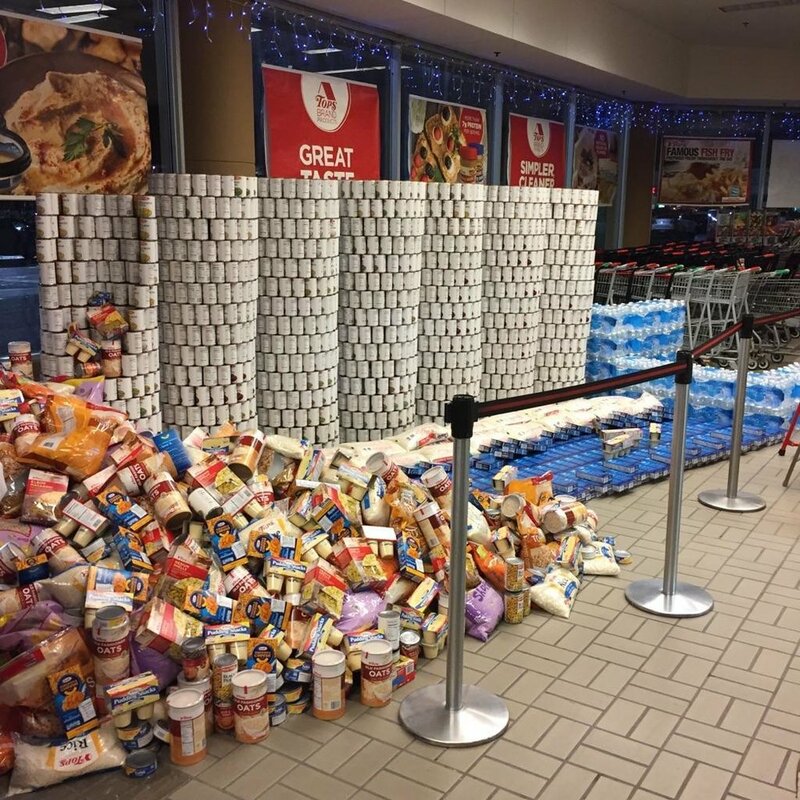 All of the non-perishable food used in the display (10,000 cans!) gets donated to the Food Bank of WNY! We're so excited to announce the Seneca One Stop in Niagara Falls is now open! Thanks to project manager Wendy Ferrie, RA for all her hard work! Each holiday season, members of B Team Buffalo organize a grassroots event called City Of Light. The goal of the initiative is to decorate a neighborhood in the city so that it shines for the holidays. A few of our team members went and volunteered their time, decorating the streets near the Buffalo Central Terminal and adding a sparkling touch to houses in the neighborhood! We're proudly partnering with The Kissling Interests, LLC to renovate the 11-story structure at 298 Main Street into a mix of office space on the six lower floors and twenty-six apartments on the five upper floors. Happy to welcome tenant Campus Labs to this great space in downtown Buffalo! Happy Birthday to Wendy Ferrie and Joe Palumbo! Our interiors department did an amazing job recreating Frank Lloyd Wright's Falling Water House out of gingerbread for the Millington Lockwood competition!! Make sure you check out our Facebook for even more photos and videos!! Happy Holidays from the entire Carmina Wood Morris team! We decided to forgo our annual bowling party and instead created a murder-mystery event for our entire staff to enjoy. Some of our staff seriouslyyyyyy got into character, which certainly created an afternoon of laughter! In August, we featured our HCR funded project for People Inc., the Highland Park school conversion. Now, we have even more progress shots for you as this circa 1952 building transforms from an abandoned school into 38 apartments! This month, we celebrated Jon Morris's hard work as he was honored as a Buffalo Business First C-Level Executive! Jon has been a vital part of our firm for over 12 years and we are so proud of all his accomplishments! Adding to the momentum behind Niagara Street's revitalization, we're partnering with Bill Breeser on the renovation of 1225 Niagara Street! We announced last month that our work on the LAPC Lofts in the Elmwood Village was recognized as an "Outstanding Project" by the Preservation Buffalo Niagara, but this month we officially got to celebrate! Here's a snapshot of the award ceremony! Happy Birthday to Associate Paul Lang! It was requested to be noted that on October 4th at 1:14pm, Mike Bray said Joe Dorobiala was "absolutely right." And then we turned Mike Bray into a dog... his favorite. (ha-ha). Happy National Boss's Day to the best bunch of bosses we know!! Our team has been working tirelessly on this new development in the Elmwood Village. Our approach to this project is to make it look to the pedestrian like a three-story building, and not a five-story building, by setting the top two floors back from the street and incorporating quality materials, classic architectural detailing, sufficient parking, green space, and environmental sustainability. The current plan is to create 57 high-end townhouse condominiums with ground floor retail and parking hidden from view on the southeast block of Elmwood Ave, south of Forest Ave.
From rendering to real life - the Hyatt Place at 310 Rainbow Boulevard in Niagara Falls has had its ground breaking ceremony and is now under construction! OUR FACES: Meet The CWM Team! Progress on the corner of Genesee Street continues as paint was removed from the facade of 9 Gen., finishing up the renovation of the circa-1845 structure! Happy Birthday to Bob Kroon [Financial Director], Joe Dorobiala [Architecture], Shari Servillon [Architecture], and Lee Schlatterer [Senior Designer, Interiors]! Work on 1502 Niagara continues, with plans for a 5,000SF restaurant owned and operated by Chef Martin Danilowicz, dubbed "Roost" to open by September! Formerly the Bison Storage Building box factory, 1502 Niagara Street is being developed into 41 one and two bedroom loft apartments known as 'The Crescendo'. Don't miss out on your chance to be a part of Downtown Buffalo's resurgence! The Phoenix Brewery Lofts are now leasing; schedule a tour to appreciate this new standard in adaptive reuse, with solid surface flooring, exposed bricks, and historic details! Thanks again for taking a moment to catch up with all things CWM! We hope you learned something new and can go out and spread the BUFFALOVE! The CWM family is excited to join the Salvatore family in the grand opening of The Delavan. It was an honor to be their partner in the creation of this fantastic boutique hotel. At CWM, we believe in the vision of our clients. Their ideas give us the inspiration to be innovative, using our imagination and planning skills to devise one-of-a-kind concepts. From rendering to real life- Key Tower's newest addition, IBM, is contributing to the ever developing downtown workforce! We're working on completing IBM's interior design for the top seven floors of the tower. Favorite Quote: "Keep Calm & Carry On"
This month, a few of our team members travelled to Albany for the NYS Preservation Conference, celebrating their 50th year anniversary! Paul was one of the speakers; discussing the preservation of religious architecture. GIVE BACK: "Women In Construction"
Wendy Ferrie from our Architecture department paid a visit to McKinley High School to help educate and inspire young girls on what it takes to be a design professional! Discussing how she got started in her career and what her day-to-day activities look like, Wendy shared her story with these girls in the hopes they will consider pursuing a similar career. Happy Birthday (if you can find him!) to Kyle from our Engineering Department! We've been fortunate this month to find three new CWM employees! Patrick Sheedy in Engineering, Michael Lautner in Architecture, and (promoted from intern) Elizabeth Decker in Interiors. We are also welcoming newcomer Bradley Everdyke as a Historic Preservation Architecture intern and bringing back Architecture intern, Joe Troia! Welcome to the family! From rendering to real life! The historic White Building restoration at 298 Main Street is moving right along! Best piece of advice? Never let anyone tell you that you can't have another piece of cake. Thanks to a survey sent out by Buffalo Business First, we were honored as one of the Best Places To Work! We truly are a second family here at CWM, and are so fortunate to be able to do what we love, with who we love! Happy Birthday to John Whaley from our Architecture Department! Once again, we are partnering with Buffalo State and the 500 Block Association to provide the Sophomore Interior Design students with a unique class project. After a recent tour of the 500 Block, the students will now have the chance to create a four-unit mixed-use infill project, continuing the block's development and increasing awareness of the resurgence happening downtown! This February marked CWM's fifteenth year of business in the Architecture Engineering and Interior Design industry. We had an especially memorable year in 2015, where we were presented with three of eight awards for Excellence in Historic Preservation from the Preservation League of New York State, marking the firm's third, fourth, and fifth time winning the prestigious award. One of our young architects, Paul Lang, was named a Buffalo Niagara Partnership Spotlight Professional for the year, featuring a personal highlight throughout the month of October. In addition, CWM received the Pro Bono Publico Award from the AIA Buffalo/WNY Design Awards for our work on the First Trinity Lutheran Church. We truly believe in Buffalo's new slogan, "One Buffalo." Without all the pieces of the redevelopment puzzle coming together, we wouldn't be where we are today. Buffalo has a bright future ahead and we thank you all for being a part of it with us! From rendering to real life! Salvatore's boutique hotel, The Delavan, is moving right along! If you could do any other job what would it be? Singer! Who would you most like to have dinner with? My girlfriends! Todd from our Interiors department presented for Catholic School's Week Career Day at Christ the King School in Amherst, helping to educate 6th 7th and 8th graders! Happy Birthday to Steve Carmina & Jon Barniak! Steve's favorite birthday treat is carrot cake... aka a muffin. The CWM Birthday Crown just gets better over time, don't you think Jon?! Thanks to Working for Downtown for inviting Steve to give a lecture at the Library this month! We had a great discussion on all the development that's happening right in downtown's core! Our newest partner, Michael Bray, was featured in Business First's "How I" section, where he discussed supporting Buffalo's revitalization. Reporter Jane Schmitt covered everything from our firm's move to Main Street to how we practice what we preach in terms of preservation and reuse. Use the link below to read the full article! We're partnering with KCG Development to turn the former A&P Warehouse on Swan Street into market-rate apartments. Currently, we're working on securing historic tax credits to help with the project's financing! Hey reader, thanks for joining us! Tune in next month for even more CWM News and don't forget to send your thoughts or suggestions to dkubera@cwm-ae.com ! The annual AIA Design Gala was held mid-November, where we had the pleasure of being honored for our work on the First Trinity Lutheran Church with the Pro Bono Publico Award! Congrats to all who participated in the Soelberg Industries Design Installation Contest, including our own Interior Design team here at CWM who won for our work on Chez Ann Salon! Thanks to everyone who voted! Happy Birthday to Wendy Ferrie from our Architecture Department and Joe Palumbo from our Engineering Department! The Business First Industry Roundtable featuring Partner Steve Carmina has been published! Click the box to catch up on Steve's thoughts on all the economic development happening in Western New York! The grand opening of Fichte Endl & Elmer Eye care was celebrated this month! Congrats to our Interior Design and Engineering Departments! This month, CWM was featured as a Buffalo Niagara Partnership Member Spotlight! A blog by Marty Haumesser featured our firm's background and highlighted our progress made over our almost fifteen years of designing Buffalo. Partner Steve Carmina was quoted saying, "We believe in making a difference, in our work and in what we can do to support the community, from volunteering to getting involved with organizations such as the Partnership." We hope everyone had a safe and happy Thanksgiving holiday! Here at CWM we're thankful for our talented staff and project partners (and of course our amazing clients!). Don't forget to follow us on Social Media too! Just look for the icons at the top of the webpage! 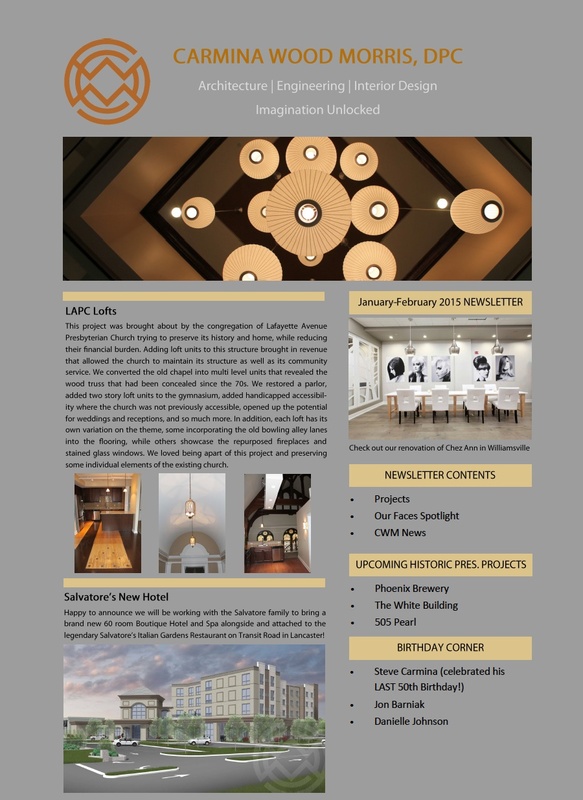 For those of you who may not be subscribers to all CWM has to offer, here's a look at our Jan-Feb 2015 Newsletter!